Yes folks, it’s time for yet another update for my Resonant Rise texture pack! With the next stable release right around the corner, I’ve been working on getting Griff’s Texture Pack ready for it. This update is built against the latest build of the Resonant Rise experimental branch, which at the time of this writing is 2.6.17.1-EXP-RC. Since this will shortly become the 2.7.0.0 stable release, I thought I would get a jump on it and release this so you guys have a shiny new version to celebrate this big milestone (thank you Velotican). Download is available as usual on the dedicated page here on the site (go to the Minecraft page and click the link on the left for Griff’s Texture Pack). Many fixes were made and some textures were swapped out, so a fresh install of the basepack and this update is recommended. 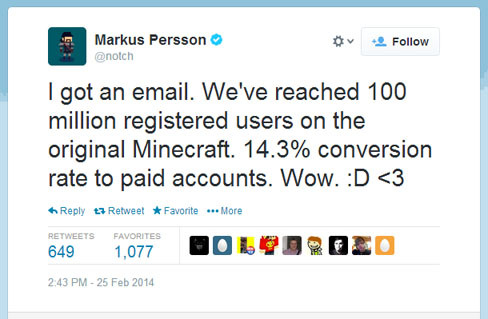 Notch has tweeted the latest sales statistic showing the staggering success of Minecraft, which has reached an incredible 100 million registered users. I’ve just released an important update for Griff’s Texture Pack for Resonant Rise. Thanks to some helpful users on the RR forums, I was able to identify a problem with the pack, and realized that I goofed. I accidently left some 512x WIP textures in the pack instead of resizing them down to 64x. On a reasonably good machine, you probably would not have noticed a performance hit, but with an older video card, you might have experienced a few lost FPS since the last update. Not a gamebreaker, but still an oversight that needed to be fixed. I have resized and re-added the offending textures, and while I was at it, I also made a few quick updates to the pack. If you’re a Dartcraft user in particular, you should update to version 14a immediately. – finally got around to substituting Emasher textures for Chisel’s un-Spahx-ified Limestone and Marble. No more unsightly worldgen! Griff’s Texture Pack for Resonant Rise updated! I have just released version 14 of my Sphax texture pack compilation for Resonant Rise. This is a pretty major update, with a good number of new additions, as well as the usual updates and fixes. We can all thank Mother Nature for dumping an unusually huge amount of snow in our area, which gave me the opportunity to get this finished. You can find the mod download and installation instructions on the dedicated page in the Minecraft section of this site.